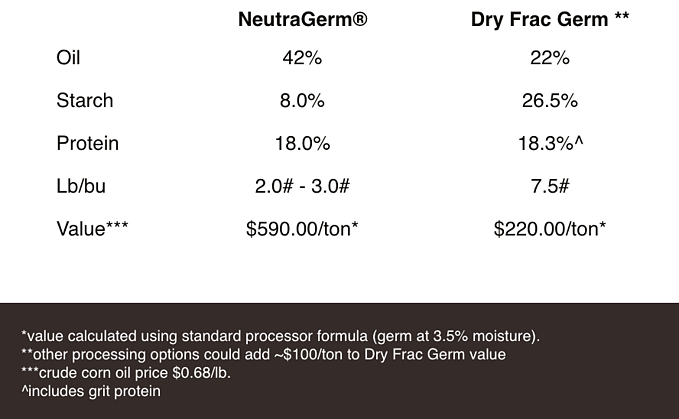 Improve your frac operations bottom line with germ wet milling. Learn more about germ wet milling from AMG engineering. Returns soluble nutrients back to fermentation, requiring less starter nutrients. Our Products For The Food Industry Are Marketed Under The Brand Prairie Sky® Ingredients. NeutraGerm® is produced using no SO2. The low temperature drying system, delivers a high quality, low moisture (3%), food grade product. Low residual starch levels maximize product oil content. Solaris® Brand Of Ingredients Are Sold Exclusively To The Feed Industry. ProBran® - a highly digestible source of fiber, ProBran is a very palatable, high fiber option. Low dust, ProBran is very flowable. Energia® - with a higher protein level than DDGS, Energia is a pelleted, low-fat ingredient that is extremely digestible and can be used in higher concentrations for both ruminants and monogastrics. Energia is also low in phosphorus, low in potassium, and low in moisture. Energia is a very palatable and highly digestible source of critical nutrients.